Update: The clip from the show has been added to the post. Candy Crowley is examining the State of the Union: Mental Health on Sunday, 1-16-11, and I will be one of her guests. Dr. Fred Frese and I are scheduled to be interviewed between 9:15 a.m. and 9:30 a.m. EST about our experiences in the mental health system. Continue reading to view the clip from the show. Out of last week’s mass shooting in Tucson have emerged endless questions. This Sunday, on a special edition of State of the Union, we’ll spend the hour searching for answers as we look at the state of mental health. First, an overview of schizophrenia and other potentially debilitating mental disorders with two specialized experts: Dr. E. Fuller Torrey, the executive director of the Stanely Medical Research Institute, and Dr. Lisa Dixon, the associate director of the Mental Illness Research Center. Dr. Fred Frese, a psychologist for 40 years, is the former president of the National Mental Health Consumers’ Association, and was diagnosed with paranoid schizophrenia as a young adult. 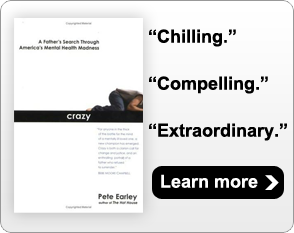 Pete Earley is a former national reporter for the Washington Post and author of a dozen books, including “Crazy: A Father’s Search Through America’s Mental Health Madness,” which details his journey seeking treatment for his adult son who was declared mentally ill. Finally, we’ll talk with the co-chairs of the Congressional Mental Health Caucus, Rep. Tim Murphy (R-Pennsylvania) and Rep. Grace Napolitan (D-California). Where can we go from here? What legislative obstacles stand in the way of meaningful reform? Join us for a fascinating, in-depth look at the state of mental health, this Sunday on a special edition of State of the Union. For more information on State of the Union with Candy Crowley and some more resources on mental illness, visit the show’s CNN site. I am not a conspiracy theorist but I am not stupid there are numerous “places that have been built for house people and currently they are no occupied. I full suspect this administration to not go without a whimper even though the American populace has certainly spoken their mind in November. I do think that Obama will do ANYTHING and use EVERYTHING in his power to put opposition down. Rahm Emmanuels evil crazy brother has an idea on how to save money AT WHAT COST? A person who thinks that there will be no “death panels” should fly a flag with an Ostrich with it’s head stuck in the dirt on their properties. Pete the changes all of us would like to see I am sorely afraid are going to come like a freight train headed at the average America Citizen, and IF the average America Citizen is placed into these “places” then what will then be the fate of the mentally Ill people they care for. I for one would die free and with my mentally ill son than be a slave and fear for his fate. Frank, I think we can all agree that having a dialogue about the issue is important and that media can play a powerful role in setting the agenda for it to be taken more seriously by more people. Educating the public to the fact that mental illness is an ILLNESS is the first step. Please post a replay for the elderly “late sleepers” ! video is up now on this post! Pete, am watching now, thanks for speaking for parents and telling our fears and frustrations. This segment by CNN was long overdue. Great discussion Peter. As a parent with a son diagnosed 12 years ago, it was important that this dialogue goes mainstream. I really enjoyed hearing from you this morning and learning of your courageous and affirming story. As the parent of a 21 y.o. child struggling with the onset of mental illness in late Fall (still not completely diagnosed), my husband, son and I are reeling and under the incredible stress with which I am sure you can identify. We have incredibly good health insurance, for which we are so grateful, but even with amazing resources and excellent physicians, parenting a 21 y . o, with confidentiality restrictions is, in itself, a tremendous challenge. At this point, he is very depressed and the medications have not really been titrated completely effectively, so he is still wanting and requiring our assistance. I worry about compliance and collaboration when he feels better. And the stigma with which he’ll deal moving forward, when trying to explain his return from a distant University and his significant change in plans. If EVER there was a time for our country to wake up and completely reform mental health law and policies, it is now. Everything my own son has been through COULD and WOULD have been prevented if the laws had been different. For five years… before my son’s accident in 2005, I placed frequent calls to 911, psychiatric hospitals, doctors – was told repeatedly that, unfortunately, there was nothing they could do to help him because our laws disallowed forced treatment unless he was basically homicidal or suicidal (which he never was). It took a car accident that injured a man, five years of the criminal justice system incarcerating without treatment and our spending somewhere between $75-100,000 to FINALLY get him help – it took TEN YEARS! A hell no family should have to endure. Our laws KEPT him ill and untreated, and CAUSED the accident. THEN our laws punished him for what they caused. Makes no sense. Is it any wonder that, in most prisons nationwide, up to 70% of inmates are mentally ill? Jails and prisons have become where the nation’s mentally ill are now housed – where the mentally ill languish, untreated, their brains deteriorating – being punished for what happened as a result of a BRAIN DISEASE! Explains why prisons are overcrowded and have become such big business. If the excessive money spent on prisons were spent on mental healthcare, mental health treatment centers could be opened and prisons closed! The mental health care crisis IS this serious! If you saw what I have seen in jails/prisons, it would break your heart in two. Sad that it takes a national tragedy involving a politician before change is even discussed. And I wonder….will this be a fleeting concern and conversation? Or will this finally be the impetus for solid change in this country? The deceased and injured in Tucson were certainly victims, but so was the shooter – a victim of our barbaric laws and policies and the inability for others to effectively help him before it reached such tragedy. I pray for immediate and drastic change, so that people trapped in such mental torture can be TREATED early in their illness when there is a better prognosis for long-term recovery; rather than PUNISHED and incarcerated for the ensuing tragedies that destroy yet more lives. Involuntary treatment is often the best and most effective way to liberate a person trapped and tortured by a psychosis. By acting quickly with appropriate care and treatment, the brain disease may not be nearly so debilitating. The patient will have been spared from acting on disordered thoughts. Those civil libertarian lawyers , patients advocates,some consumer survivors ) have over the last fifty years, either failed to understand the nature of a psychosis or have wilfully blocked any reasonable mental health laws that are meant to help get fast aid to those afflicted with schizophrenia and similar psychoses. They have swung the pendulum too far. They should be held to account . They are indirectly responsible for the slaughter in Arizona and the fact that there are no hospital beds or adequately resourced community services for those individuals who suffer from these brain diseases. Politicians have been tranced and intimidated by the rhetoric and nonsense from the civil libertarians. The Canadian Charter of Rights and Freedoms ( first section ) balances individual rights with society’s rights . There is a reasonable right to personal safety. Nothing was learned from Virginia Tec. The slaughter in Arizona leaves in its wake six dead, many maimed ,a shocked nation, and misery to many families. It remains to be seen as to whether there will be a political will to pass appropriate mental health legislation and put some mental health beds back into the system. I recommend a google trip to the Treatment Advocacy Site or CFACT site in Canada. ( Citizens for Appropriate Care and Treatment . No family should have to lose a loved one to an untreated psychosis. Paranoid Schizophrenia does not respect freedom to choose , it traps and tricks its victims. Should the man from Arizona respond well to treatment and regain insight that he was mad not bad , he will not thank the libertarians for leaving him to the mercy of his delusions. Choice of words is an important part of any productive discussion. Talking about mental “health” when the subject is clearly mental illness is word abuse. To use an old chestnut , I suggest we “call a spade a spade” and not allow mental illness workers to become word-dictators by influencing us to hide reality, by not using clear and correct language like “illness”. I totally agree. And while we’re on the subject of using correct terms, why are PATIENTS so often referred to as CONSUMERS?